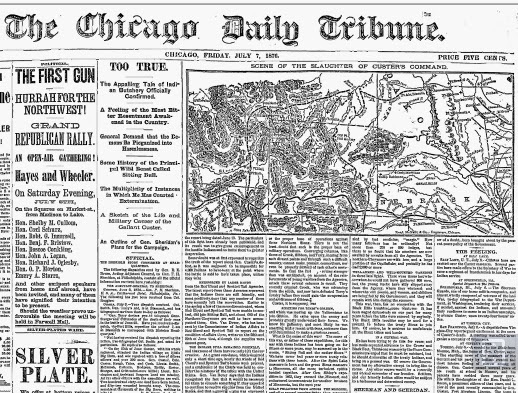 In a 1921 “Remember When….” article in the Tribune, one elderly Chicagoan remembered that General Custer had come through town and stayed at the Palmer House on his way to fight the Battle of Little Big Horn in 1876. It’s often said that Custer thought the battle would be the victory that propelled him towards the presidency. Instead, of course, it became known as Custer’s Last Stand. Custer and five companies of his regiment were wiped out. Truly, exactly what went on in the battle is shrouded in mystery and conflicting accounts even now. I’m no expert on the story, and it’s hard to think of Chicago as a “Wild West” sort of town, really, but the Windy City has several interesting connections to Custer’s Last Stand, many of which involve the Palmer House Hotel, which is still in operation (though it’s been totally rebuilt since the 1870s). Upon completing the interview, Bergin was accosted by a con artist who claimed to be from the military, and Potter Palmer himself intervened. My understanding is that this is still among the best sources we have to tell us how, exactly, Custer was killed. More famously, the Palmer House was the site of the Reno Court of Inquiry. Major Reno was accused of cowardice in the battle, and personally asked that a court of inquiry be held. The case, which brought forth several eyewitness testimonies right there in the hotel, became one of the military’s most often sited trials of the sort; you can still read all of the testimonies today. I haven’t tried it, but I understand they’re a fascinating read. Reno was eventually exonerated, though by that time he’d already been convicted in the court of public opinion, and many still believe that the whole thing was a sham. Chicago played another role or in the the history of the Battle of Little Big Horn some decades later. In 1908, a man in the front row of a re-enactment staged at Riverview, the amusement park, died of his wounds after being accidentally shot by a performer who was apparently using live rounds. Based on surviving accounts, the show featured a lot of exciting stunts and riding tricks (that were probably at at all historically accurate. 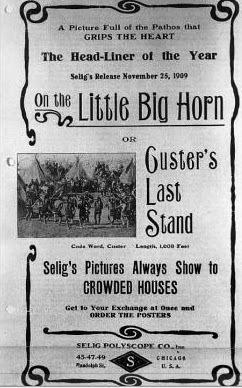 Around the same time, three Sioux warriors who had fought in the battle played themselves in On the Little Big Horn – or Custer’s Last Stand, a silent film about the battle that was filmed by Selig Polyscope, with the man-made hills on the Selig backlot near Byron and Claremont filling in for the hilly border of Wyoming and Montana (like nearly all Selig films from Chicago, it’s now lost). The crew was thrilled to meet them and plied them for stories, but their reply was something along the lines of, “Well, it was all over so fast….” The film was shot in Chicago (though some sources erroneously claim it was filmed on the actual battle site), but I couldn’t find any evidence that any theatre here actually showed it!